LEAMINGTON is one of the most attractive places to visit for a football match, but if you’re looking for floodlights amid the Regency splendour of the Spa town, you’re out of luck. Leamington’s New Windmill Ground is five miles out of town and there are literally no chimney pots, let alone pylons, in view. While this does have its disadvantages, the road from town to ground seems to have more and more houses being built, so maybe one day five miles will be somewhat reduced. The ground itself is tidy, functional and there’s plenty of room, but two years ago there was talk of the club being relocated to a new 5,000 capacity stadium. The club enjoys good support, but crowds at the New Windmill are the lowest in almost a decade, despite the team leading the Southern League Premier Division. In 2016-17, Leamington average 423, some 200 lower than when they were in the National League North and 120 smaller than their promotion year of 2012-13. It does fuel the argument that out-of-town grounds discourage supporters. There’s plenty of reasons for them to make the trek out to the New Windmill for before facing Hitchin, Leamington were unbeaten at home and four points clear at the top of the table. They had lost just twice all season in the league. With Hitchin in fourth place and also playing well, it was no surprise that this was the game of the day in the Southern Premier. Hitchin’s supporters are naturally pessimistic and most went to Warwickshire with low expectations. “Anything will be a bonus,” said one long-standing supporter. What they failed to recognise was that this was also a tough fixture for Leamington and the Canaries had beaten the “Brakes” on their last visit to the Windmill with an audacious lobbed goal by Callum Donnelly. The season has been shaping up nicely for Hitchin and they are now among the play-off contenders and repeating 2015-16’s consistent form. If they do manage to finish in the top five again, it will be the first time they’ve managed that at Premier Division level in their history. In their Athenian League days, they were regularly in the top four or five, but the divisions were much smaller. 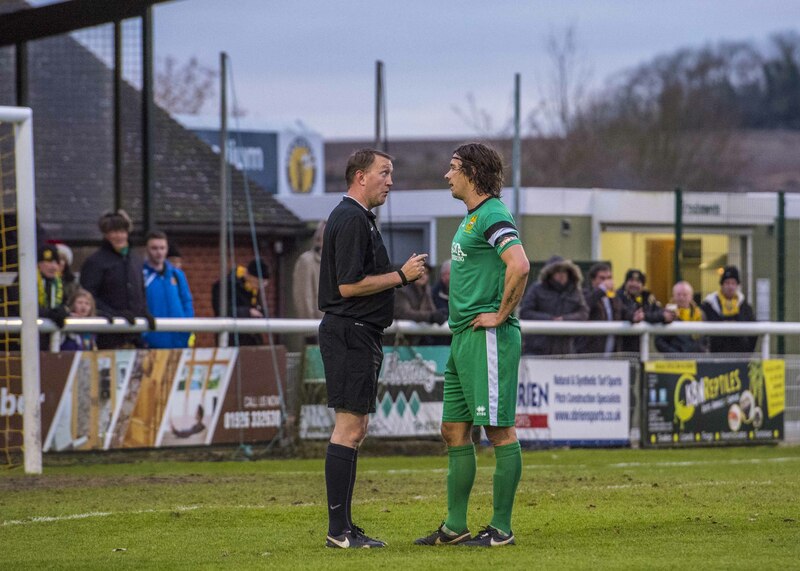 With manager Mark Burke absent and his number two only watching a la Mourinho after receiving a red card, the Hitchin team was left in the hands of Steve Conroy. They opened the game in a very positive frame of mind. And in the 30th minute, they took the lead when Kane Smith’s cross was headed home at the near post by Brett Donnelly. Donnelly celebrated with the Hitchin fans behind the goal and was promptly booked by referee Phil Hardisty. It was a ludicrous decision by Hardisty – does he not realise that one of non-league football’s endearing features is the relationship between players and fans? – who went on to have an error-strewn game. What’s more, time and time again, he failed to see the clever gamesmanship of some Leamington players, who appeared to set out to provoke one or two of the more temperamental Hitchin lads. They had their eye on Brett Donnelly from the start and eventually, they got their wish. Hitchin had a golden spell after the goal with keeper Tony Breeden – an impressive individual who almost acts like a sweeper – tipping over a Ben Walster effort and then Liam Brooks striking the woodwork. After the interval, Leamington’s fans found their voice and it looked as though their team would launch an assault on the Hitchin goal. In the 64th minute, however, a nice move involving Callum Donnelly and Kane Smith ended with Brett Donnelly finishing for his second goal. This time, there were no celebrations! Leamington had to thank Breeden for keeping them in the game as he made excellent saves from Walster and Robbie Burns. Ten minutes from the end, Brett Donnelly was given a second yellow after a clumsy challenge on Jamie Hood – there could be no complaints about this card but given he had been needlessly booked in the first half, he had to go. Almost immediately, Leamington pulled a goal back from the head of Courtney Baker-Richardson. With the visitors down to 10-men and the initiative swinging Leamington’s way, there was still a chance for the league leaders to draw level – including seven minutes of added time. Conroy signalled to his team to keep calm as the pressure built. Callum Donnelly, before being wisely subbed after his yellow card, prevented Jack Edwards from scoring and Dan Webb got in the way of a drive from Richard Taundry. Goalkeeper Michael Johnson also stopped a goal-bound effort from Richardson and time ticked away. Hitchin hung on, but you got the feeling that if the contest had gone on another minute or two, Leamington would have equalised. It was an excellent game and a great advertisement for Southern League Premier football. For Hitchin it was most definitely a “statement win”, for Leamington a reminder of the credentials of other contenders. When the two teams meet again, it will surely be worth watching!